Skype today updated its iOS app to version 6.25, adding support for new features that were introduced with iOS 10. Skype now integrates with Siri, allowing users to ask Siri to make a call using Skype for a hands-free way to keep in touch with friends and family. With iOS 10 and SiriKit, calling someone on Skype is as simple as using the same voice commands you're already using. Let's say you're trying to call Lucy Archer on Skype. If you have her Skype contact information saved in your iOS device, simply say "Call Lucy Archer." Siri may ask for you to confirm it has the right contact--one click later and your Skype call is initiated! 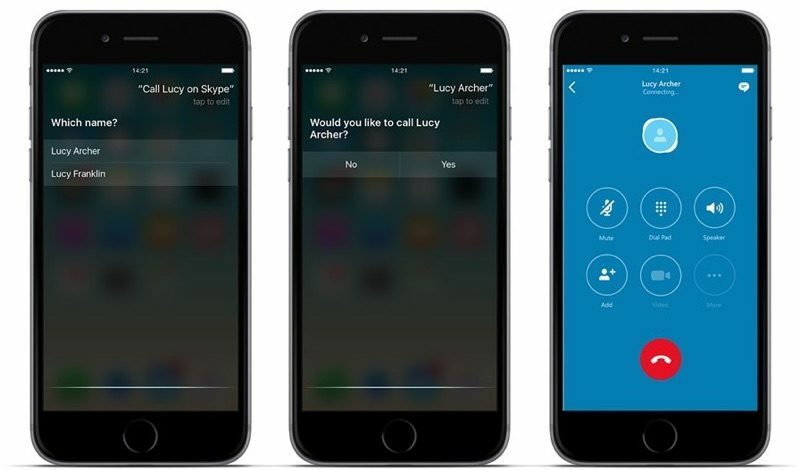 In iOS 10, contact details for Skype users can be added directly to the Contacts app, which makes it easier to initiate Skype calls and messages through Siri without the need to open the Skype app. You can also invite friends to join Skype from the Contacts list. Today's update also introduces support for CallKit, allowing incoming Skype calls to be displayed on the iPhone just like a regular phone call. Skype calls can be answered like traditional phone calls using the built-in iOS functionality, which means they're answerable from the lock screen. As always, Google is taking their sweet *** time implementing CallKit in the Hangouts app. Really? Maybe I should tell my 160,000 person company that we're using an obsolete product.